Pregnancy Hypothyroidism Indian Diet, Thyroid and Pregnancy, Pregnancy is one the best phase of a women’s life. You just pray for a healthy pregnancy and a healthy baby at the end of the term. To ensure the health of the mother, a list of lab tests are prescribed on timely basis. Thyroid tests also form a part of this list. These tests are essentially a must to avoid any complications. Hypothyroidism may occur during pregnancy. The growing fetus is dependent on the mother for its dose of thyroid hormones in the beginning months. The thyroid hormones play a role in normal brain growth and development of fetus. Later on the baby develops thyroid and can make his/her own thyroid hormones. While some women may have pre-existing thyroid disease, but most times mother-to-be develops a mild hypothyroidism during pregnancy. This is quite likely to go unnoticed, as most of the symptoms of hypothyroidism and pregnancy are the same like – fatigue, intolerance to heat and weight gain. It is quite likely that these women may suddenly find themselves in progressed stage of hypothyroidism. Check with your doctor and get timely treatment. Deprivation of thyroid hormones due to the presence of Hypothyroidism during pregnancy can affect the fetus to great extent and also lead to pregnancy complications. Chances of anaemia, premature baby, miscarriage etc. all increase if this condition is left untreated. Follow your diet to the best – this will help you stay healthy and provide the best nourishment to your growing bundle of joy too. 1. Cereals: Oats, buckwheat and quinoa are the best options. Consume wheat and its products if tolerable. Amongst rice, brown rice in restricted quantity with loads of veggies can be consumed. Try Oats Vegetable and Brown Rice Khichdi or Buckwheat Pancakes. 2. Dals & Pulses: All dals and pulses can be devoured. Make up for your protein requirement with recipes like Dal and Vegetable Idli. 3. Fruits: All except pear, peach, strawberry and papaya. Try other fruits like orange, grapefruit, sweet lime, avocado etc. and create healthy recipes like Sweet Lime and Pepper Salad. You can use it more innovatively to make a dip like Avocado Dip too! 4. Vegetables: All except goitrogens like broccoli, cauliflower, cabbage, kale, spinach, Brussel sprouts, turnip and pakchoi. Instead try a healthy Salad like Avocado and Tomato Healthy Salad. 5. Dairy: To have high fat or low fat dairy products can best be decided by your dietitian. It depends on weight gain, intensity of hypothyroidism and other foods consumed. If you have been advised to go with low-fat dairy products and want to make them at home, here’s the recipe of low fat curds and low fat paneer. 6. Nuts: Almonds, cashew, peanuts, flax seeds, walnuts, and pine nuts should be avoided as they may have thyroid inhibiting compounds. 1. Avoid feasting out regularly. Most important is to cook healthy at home. Be little creative and combine different food groups to make nutria-dense dishes like Gavar Masoor Dal. 2. Avoid soy in any form. It interferes with thyroid function. 3. You will need more iodine when you are pregnant. Deficiency of iodine is often a cause to hypothyroidism. Thus low levels of iodine can worsen the situation. Sources of iodine are iodised salt and eggs. Find out from your doctor if you need any supplementation. Try Fluffy Egg White Masala Omelette for breakfast. 4. Do not miss out on antioxidants. Turn to fenugreek leaves, romaine lettuce, tomatoes, capsicum, brinjal etc. in the vegetable category. Try Carrot and Methi Subzi, Tomato Omelette and Eggplant Dip. 5. Fruits are you best in-between snack. They will fulfill your fiber requirement and keep you full too. Just chop the fruit and eat it fresh or alternatively pep it like done in the recipe of Healthy Guava Salad, while whole fresh cut fruits are the best, you can also try sipping on unstrained juices like Apple Carrot Drink to make up for fruit dosage of the day and overcome nausea if any. 6. Sprouts are healthy addition too. Use them to make soup like Moong Soup and or salad like Mint and Apple Salad and and Zucchini Bell Pepper and Sprouted Moong Salad. 7. Avoid other foods that might hurt your thyroid. Vegetables like corn, asparagus, radish, sweet potato and mustard greens may be a concern to some. Try healthier ingredient like mushrooms if you have them in pantry and quickly make Grilled Mushrooms. 8. Avoid coffee, carbonated beverages and alcohol for sure. They are anyways not healthy for healthy people too. Make a habit of sipping on health concoctions like Minty Cucumber Cooler. 9. Breads, biscuits, pizza, burger can be once a month treat. Satisfy your craving for these foods, if any, only with a small portion size. They will just pile up unnecessary calories. 10. Discuss about inclusion or exclusion of high carb foods. Potatoes, yam, purple yam, sweet potato, mango, chickoo, custard apple and banana are loaded with carbs. If you are adding extra pounds than needed for a particular trimester of pregnancy, you might be advised to keep a close check on carbs being consumed. Masalewali Turai and Mixed Dal Chilas are some healthy options suggested for you. While the above pointers have been pen down very carefully, pregnancy and hypothyroidism both need individual monitoring. Always follow the 2 D’s – DOCTOR and DIETITIAN. They are the best to judge your health and prescribe medication and diet. 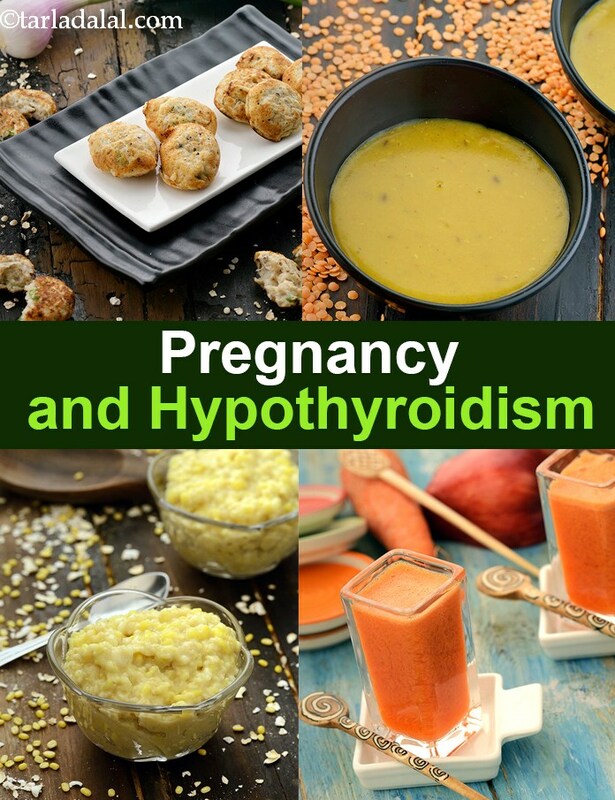 Enjoy our Pregnancy Hypothyroidism Indian Diet, Thyroid and Pregnancy and other thyroid recipe articles below.